The climate talks in Durban have drawn to a close at around 5AM local time after a marathon all-night session. It is too early to tell what exactly was achieved during these negotiations, although it is clear that the talks were not a complete failure. In addition, it appears that future decisions will no longer be based on the scientific advice of the IPCC but instead the process is only to be informed by the science. It remains to be seen whether being “informed” by the science is a meaningful concept. The bottom-line, then, appears to be that some countries, the EU foremost among them but now fortunately also Australia, will continue to seek cuts to their emissions, whereas the largest emitters (China and the U.S.) will continue to pollute at a growing rate. On balance, it thus appears that no major global emission cuts are on the horizon until a decade from now, although this view may be slightly too pessimistic given that the U.N. process appears to have survived Durban. Assuming that no major emission cuts will take place for another decade or so, what are the consequences of this decision? To answer the question, let us set aside politics entirely. Let us assume (or pretend) that the leaders who congregated in Durban all had our best interests in mind, and let us just examine the cognitive issues underlying climate change. In other words, politics aside, what kind of thinking drives climate negotiators, and how does this thinking relate to physical reality? Revealingly, at the beginning of the Durban climate talks, U.S. climate negotiator Jonathan Pershing stated that there are “essentially an infinite number of pathways” that allow stronger cuts starting in 2020 to “stay below 2 degrees.” In other words, delay doesn’t matter, we can deal with the problem later. Technically, but only technically, Pershing’s statement is true. However, it is only true in a meaningless abstract sense, because the moment we consider technological reality his statement reflects a deep cognitive failure. Pershing’s statement betrays the well known cognitive failure to understand accumulation processes. This failure, widely shared among most people who are not intimately familiar with dynamical systems, ignores the fact that to stabilize total CO2 in the atmosphere—which is what is required to arrest further warming—we need to eventually reduce emissions to zero (or nearly so). This is because CO2 accumulates in the atmosphere in the same way as the water level in a bathtub rises while the tap is on. Absent any leakage, the only way to stabilize the water level is to shut off the tap completely. And the longer we delay before starting to turn the tap, the more rapidly we have to close it—if we delay emission cuts to 2020, then the required cuts are around 9% a year (which means every single year from 2020 on). Those cuts may not be technologically achievable. If we started in 2011, we could achieve the same outcome with cuts of only 3.7%, probably well within technological reach. 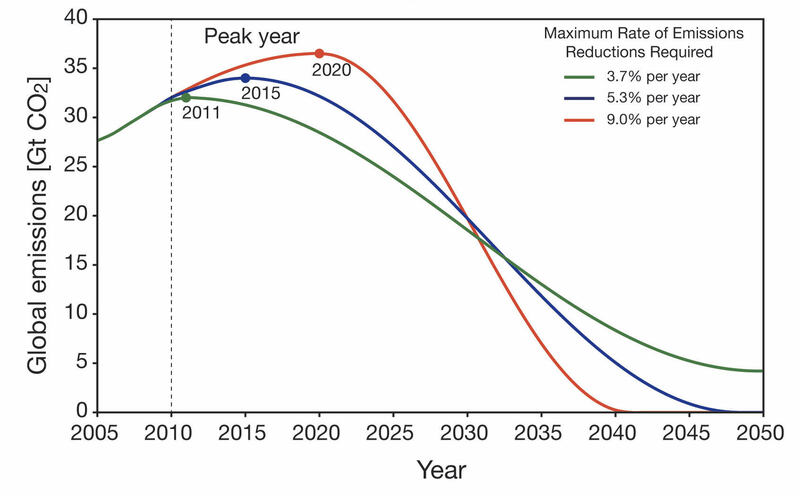 The figure below illustrates this problem by comparing the global emissions paths required to have any chance to limit warming to 2C, depending on when emissions peak. The longer we wait, the harsher the cuts. Collectively, the climate negotiators have been acting like corporate fleet managers who run their cars without oil changes or maintenance, just to improve the bottom line for a year or two. Some twenty years ago, we could have dealt with climate change for the price of an oil change. Ten years ago, the price had gone up and it would have cost us a new engine. Right now, we are in for the cost of a new car. And if we do nothing for another 10 years, our planet may remodel itself with us no longer in the driver’s seat because 9% annual emissions cuts may be unachievable. There is another cognitive trap into which climate negotiators appear to have fallen which arises from the same fundamental failure to understand the physics and mathematics of accumulation. This cognitive trap involves the inability to recognize historical responsibilities. Let us continue with the bathtub analogy. Because Western countries have been filling the bathtub for far longer than developing countries, more of the water in the tub is “ours,” rather than China’s or India’s. Not surprisingly, therefore, those countries expect us to start closing the tap before they shut theirs. However, Western commentators and politicians often seemingly fail to understand our historical responsibilities, pointing instead to the fact that China is now emitting more than the U.S., or that India is growing too fast or whatever. Yes, China now emits more than the U.S., but its total accumulation is less than a third of the American responsibility. 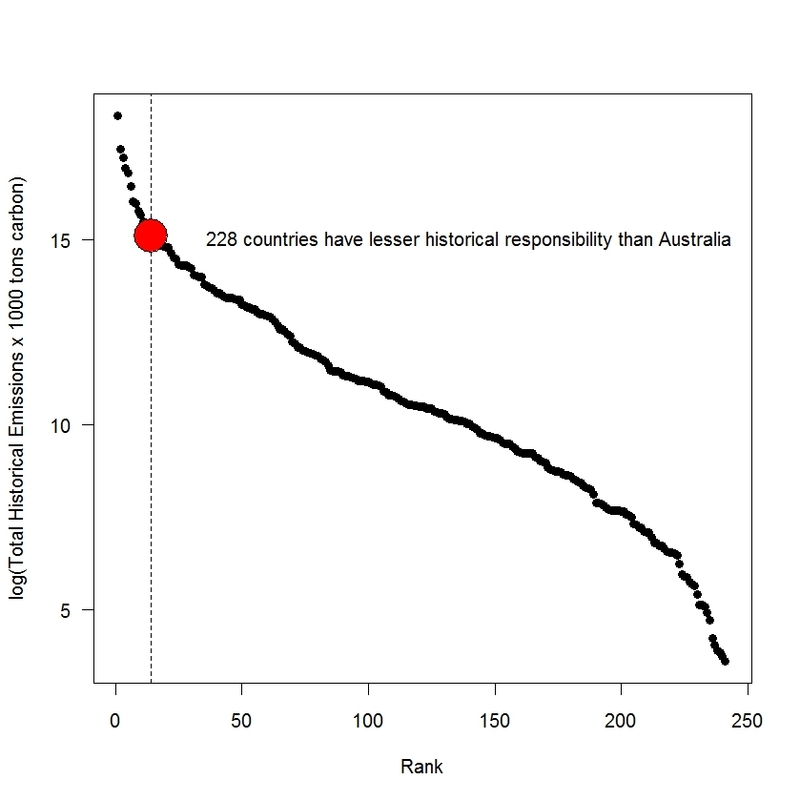 And because accumulation is what matters, Australia has a greater historical responsibility than 94% of all other countries in the world. So before we even consider politics, the cognitive challenges of climate change present a bleak picture. People do not readily understand the nature of accumulation, and that means they do not understand the relationship between emissions and atmospheric concentration of greenhouse gases. It also means they do not understand the distinction between present emissions and historical responsibilities. It is important to add that those cognitive failures are not willful: They simply reveal the limitations of a cognitive apparatus that evolved at a time when it was simply inconceivable that our species would one day affect the overall geophysics of our planet. Fortunately, those cognitive limitations do not prevent us from understanding them: It may sound paradoxical, but the tools of cognitive science allow us to understand our own thinking even if it is sometimes flawed. This realization, in turn, empowers us to correct our thinking. But of course, so far we have just considered human cognition, ignoring all the political factors that contribute to decision making in the climate context. Add politics and vested interests and you likely get the de facto decision to let our children do the cleaning up and suffering at a far greater price than we were willing to pay. It remains to be seen how exactly Durban fits into this picture. The fact that an agreement was achieved can only be positive. The fact that serious action has been delayed for another decade or so may come to haunt us.